What draws the number 3 ? A. Experienced staff who are neither industrious nor union member. C. Experienced and hard working employees. D. Experienced staff who are union members. Which number represents to those hard-working and experienced staff which is not a member of the association ? Which of the letter of the following joint diagram is present in all of geometric figure ? Identify the part by studying below picture which shows educated villagers ? When lists of participants were prepared for the different games, then some students have joined cricket team, some in hockey group and some gave their name for volleyball. At the same time some students gave their name to attend all three major sports competitions. How they are displayed in the given diagram ? 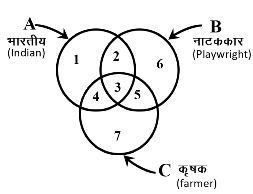 Villagers is represented by circle in the following diagram, educated people through triangle and employed people through rectangle. This statement has been demonstrated by what points – some educated villagers have engaged in employment? Study of the shape and find that area which represents to those people who are educated and engaged in the job. But is not confirmed. The following diagram represents those person who speak English, Hindi or Tamil. 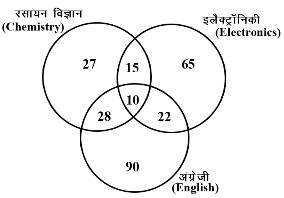 Study the diagram and Identify those people who speak neither English nor Hindi. 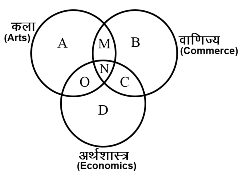 The following diagram represents to those students who study arts, commerce and economics. Study the diagram and identify that area which represent to those students who study art and commerce but do not read economics. In the given figure below doctor through square, lady doctor through triangle and surgeon through circle has been demonstrated. Identify the part marked with a letter which displays those women who are both doctors and surgeons. Study the following diagram in which a circle, a rectangle and a triangle and then answer the following question. If the circle is called 'rectangle', rectangle is called Triangle and triangle is called circle, then which of the number will be only in rectangle and not in two other diagrams ? There are a circle, a rectangle and a triangle in the following diagram. Study it and answer the following question ? 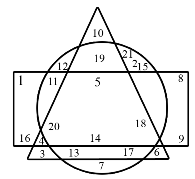 If the circle is called 'rectangle', rectangle is caled 'Triangle and Triangle is called circle then which of the number will be only in the Triangle but not in the other two diagrams ? 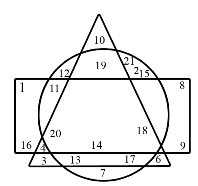 Study the following diagram which is made by a circle, a rectangle and a triangle and then answer the following question : Which of the following numbers is common in the three diagrams ? Three circles crossing one-another are shown in the given picture that represents a group of some people. Various square are displayed by serial number 1 to 7. Accordingly, tell how it fits into the display area after reading the following statement. statement : those Indians who are playwright and also farmer. Study the following diagram in which a circle, a rectangle and a triangle, and answer the following question : Which of the following statements is not true according to the diagram ? A. A and B are in all three shapes. B. E, A, B and C are in all three shapes. C. F, C, D, B and A are in all three shapes. D. Only B is in all three shapes. 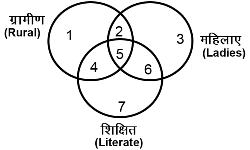 There are three mutually interconnected circles in given diagram. Each of them represents a section of the public. Then numbers from 1 to 7 of each circle has given. so read the statement below and tell about the number of circle presents properly to that statement. Engineers who are neither Indian nor also teacher. In this diagram triangle reveals girls; square to players and circle to their trainers. So please mark about those girls who are players but is not a coach. Number of those candidates is given in the graph who are failed in various examinations chemistry, electronics and English. The total number of candidate is 600. What is the percentage of those candidates who have failed at least in two subjects ? Which of the following outline denotes the Village, District and State ?